This is a Goodwill find. 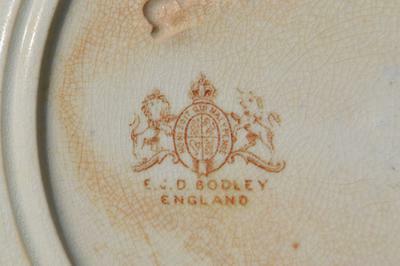 I found the exact two sold in 2009 on Ebay, but I am concerned because I cannot find this mark for EJD Bodley. The ones i find are very different. 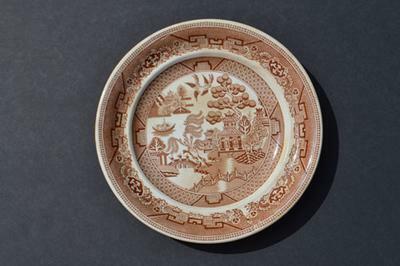 This is a brown willow transferware plate (earthenware, not china) I can find no examples of plates like this (other than the old ebay listing) by EJD Bodley. 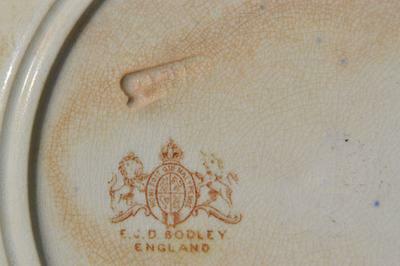 I know there were a few Bodley's through the years, so I want to make sure my info is correct on this plate. Here is what I got, "This is an antique brown willow transferware plate, measuring 7 5/8" in diameter. Made by the E. J. D. Bodley Co. in England c. 1850." Besides the mark it also has some sort of imprint in the plate itself, which looks like numbers, myabe? I am auctioning it on ebay. I really want to make sure my info is accurate. This is definitely by the firm EJD Bodley of Hill Pottery (and crown works from 1882). They were founded in 1875 and survived only until 1892. 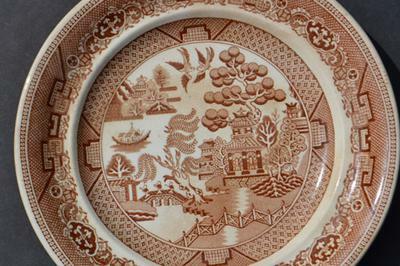 So a small short-lived maker which made both earthenwares and porcelain fine china (later to become known as bone china). This makes your date of 1850 innacurate as this would be after 1875 and before 1892. The previous incarnation of the firm called Bodely & Son only ran from 1874-5 and were before that known as Bodley & Diggory. These firms should not be confused with E F Bodley & Sons of Longport or their predecesor E F Bodley & Co. ALthopugh separate entities, it is not inconceivable the people were related. As for marks, I am glad you unearthed this one as Goddens Encyclopoedia only shows one printed trademark motif (EJDB) but explains they had several other printed marks of which he had no records. You have unearthed one, so well done!